Our BREAKTHROUGH program is more vital in today's economy than it has ever been. If your goal is to SURVIVE this economic period, then that is the best thing you will do. BREAKTHROUGH will teach you how to THRIVE during this unique economic climate. This is the time to be AGGRESSIVE and THINK BIG. This is not the time to be scared and hold back. Marc and the trainers at this event will help you acquire the proper mindset to THRIVE during this narrow window of opportunity. Program BREAKTHROUGH penting di kondisi ekonomi hari ini daripada sebelumnya. Jika Anda ingin SURVIVE maka ini adalah program terbaik untuk Anda. 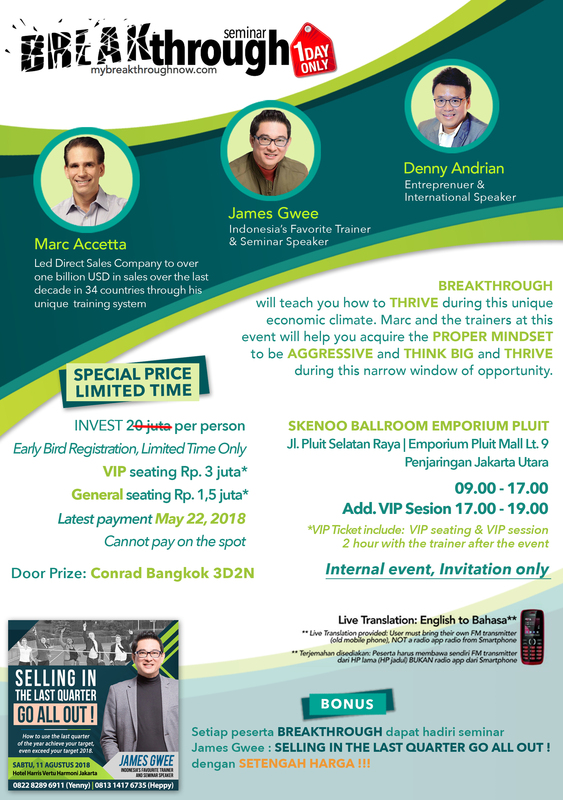 BREAKTHROUGH akan menuntun Anda bagaimana THRIVE dalam iklim ekonomi yang unik ini. Ini adalah waktu untuk menjadi AGGRESSIVE dan THINK BIG. Ini bukan saatnya untuk takut dan menahan diri. Marc akan membantu Anda mendapatkan the right mindset - pola pikir yang tepat untuk BERHASIL di jendela kesempatan yang sempit ini. Marc is currently the Founder of Marc Accetta Seminars and the Director of Training for an explosive internet based Direct Sales Company. Marc Accetta has led this company to over a billion in sales over the last decade in 34 countries through his unique network marketing training system that he has perfected in the past 30 years in the industry. 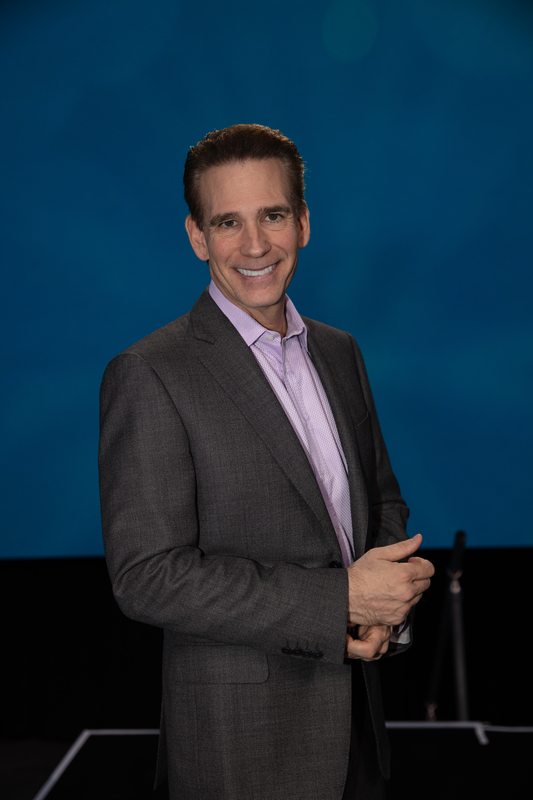 Marc addresses live audiences every month where he impacts tens of thousands of lives throughout the world. James’ dynamic, friendly and informal approach, combined with his unique combination of Bahasa Indonesia and English is so full spontaneity and humor that his training and seminars are a truly enjoyable learning experience. This makes him the Top Sales Trainer and Speaker in Indonesia today. 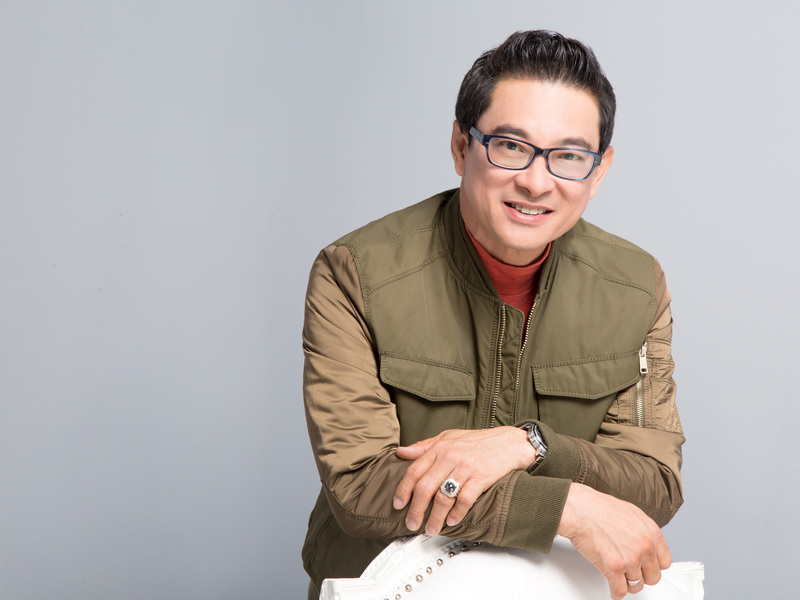 Denny Andrian is the Managing Director in various companies in IT, Communication & Energy. He started his company since 1997, thus 2017 mark his 20 years as an Entrepreneur. 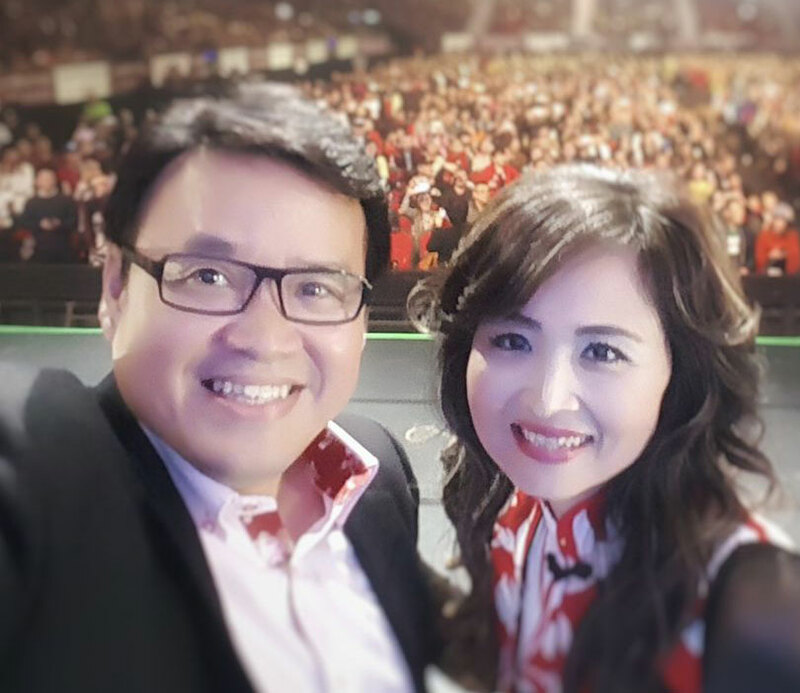 Denny & Susy Andrian have been top leaders in direct sales company. They have owned various businesses in the past and are very well respected & sought after leaders in their industry. BREAKTHROUGH gives your business the power to market like the world’s biggest brands. Here’s what BREAKTHROUGH can do to help you save time and grow sales. Detailed Personality Profiling teaching you to read people instantly and know how to best communicate with them. Learn how to ask powerful questions to control any conversation and persuade people to your way of thinking. Learning how to clearly identify your number one priority in your daily activities to assure that you achieve your primary objective. Learn how to control your thoughts and emotions, therefore controlling your actions and ultimately your destiny. Develop a proper understanding and philosophy regarding money. How to master time management and more importantly energy management. Learn how to avoid the trap of being satisfied with good results so you can ultimately achieve great results. How to overcome fear for once and for all and live your ultimate power consistently. Here are a few clips from our featured trainers at BREAKTHROUGH. 1. Transfer to the account stated below. 2. Email the proof transfer to [email protected]. DO NOT MISS THIS EVENT REGISTER NOW! Don't Miss Out on a future event! ﻿Sign up for our mailing list!